Today’s a big day for DrumMax. We’re introducing our first drum accessory, The Bullet. 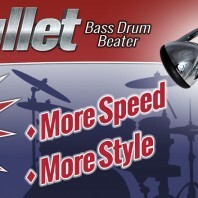 The Bullet is a new kind of bass drum beater that gives drummers more speed without losing power—essentially, you’ll have more control and be able to go faster whether you’re a jazz or metal player. The Bullet features a shorter, wider shaft that creates the kind of speed and precision you’ve always dreamt of. The aerodynamic design adds what designer Leonardo Baroncini refers to as the “cool factor.” With this thing, you’ll be flying faster than a speeding…well, you know, right? 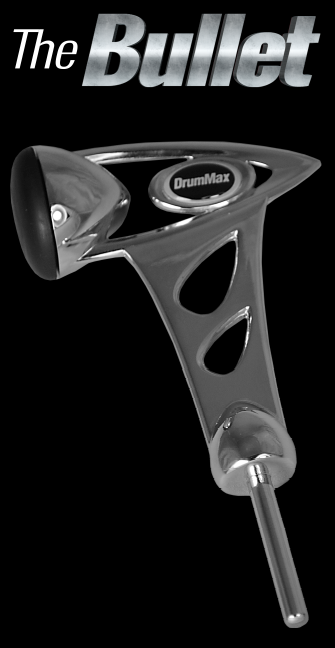 DrumMax introduces The Bullet today at the Summer NAMM Show in Nashville, TN. If you’re in the area, the show opens up to the public on Saturday, July 13, so come on over and check out The Bullet and see its greatness for yourself. We’re in Booth #210! And if you’re not in the area, you don’t have to wait for The Bullet to hit stores. You can buy yours RIGHT NOW, TODAY, and have it FIRST before everyone else! Love the concept. Any plans to make one in black? Also, it looks like that spike on the back end could leave a nice mark on the top of your foot. Hi Sage! We have quite a few plans for the future. But no worries about the spike! The beater is shorter than a normal beater and will not injure your foot or your shoe. It’s perfectly safe. What’s the length of the entire beater/shaft? Hi Justin, The entire length of the shaft is 4″. 5 1/2″ top to bottom. The usable part is 4″. That length gives you more control, and with the way the beater is weighted, you don’t lose any power. Does the rubber face of the beater wear down? If so, can it be easily replaced? Do you offer a wood face beater? We don’t yet have replacements, but we haven’t had the rubber face wear down yet, and we’ve been playing on them for a year and a half. We don’t yet offer a wood face beater, but there are lots of ideas in the works. Thanks! Why doesn’t it work with Axis, and is it home-modifiable to make it work with axis? Unfortunately the Bullet’s shaft is too thick to fit into the Axis. It is probably not home-modifiable.